Located in southern Vermont, Searsburg nearly became home to an alpine ski area in the 1960s. Circa 1961, two businessmen from Troy, New York hired Bennington attorney Stephen Gilman to incorporate a company with the intent of starting a ski area in Searsburg. Around this time, the corporation purchased land on what was locally referred to as Searsburg Mountain from the Briggs family. Initial plans for the 1961-62 season included a custom-built lift to be designed by the owners, a lodge, a restaurant, and a ski shop. While the area did not open, plans were still on the table in late 1962 when the project appeared to be further delayed. The last known mention of the project was in late 1967, when Skiing magazine once again mentioned Eagle Ridge as a proposed ski area. At the time of the proposal, the ski area would have been located less than 10 minutes from Dutch Hill and about 20 minutes from Mount Snow and Hogback. At one point, the proposal was said to include three peaks, one of which would top out at over 3,000 feet in elevation. 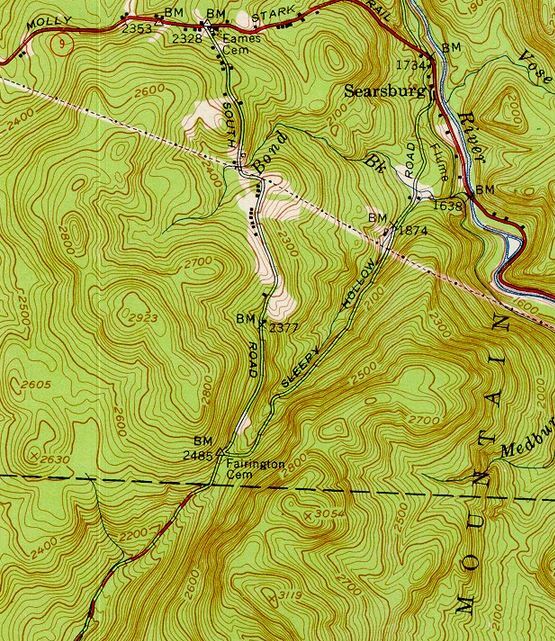 If correct, the latter parameter would suggest the area could have been located east of Route 8, on the present day location of the Searsburg Wind Farm, providing upward of 1,400 vertical feet. More likely, the 3,000 foot claim was approximated from the 2,923 foot peak west of Route 8, suggesting the ski area would have had about 600 vertical feet. There are no known remains of the Eagle Ridge ski area proposal. The Searsburg Wind Power was constructed in the general vicinity (it is unknown if Eagle Ridge ski area was proposed for the industrial wind farm ridge or an adjacent one) and went online in July 1997.
" SEARSBURG - Eagle Ridge will be a familiar name in this alpine town next winter when development of a ski area is completed by two Troy businessmen. The Eagle Ridge corporation has bought a mountain owned by the Briggs family and others, just southeast of Clarence Briggs' gift stand at the top of Searsburg Mountain. " " The proposed area nestles in a quadrant formed by Route 9 on the north and Route 8 to the east and includes three peaks, the highest 3,000 feet... "
"New Areas - Maybe." Skiing. November 1967. "Plan Eagle Ridge Ski Area Development in Searsburg" Bennington Banner. March 30, 1961.